This software is not freeware, there a few restrictions so you can evaluate the software. Batch Document Convert multiple documents with ease with Batch Document Converter Pro. when people drop files into hot folders on your network Batch Document Converter Pro will automatically convert them to the correct folder. 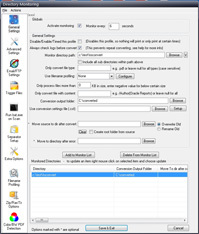 When people drop files into hot folders on your FTP site, or Email them to a designated email box Batch Document Converter Pro will automatically download and convert them to the correct folder. Add html or documents like .doc, .txt etc to batch convert from website http locations, Batch Document Converter Pro also has download to disk before batch converting option. Schedule conversions to convert automatically to any output folder at a specified time of day or month or year.